Today, I did a segment on KDVR/FOX 31 about avalanche safety. Due to time constraints, I wasn’t able to cover all of my points. So, I thought I’d add a few tips and resources here. Disclaimer: I am not an avalanche expert. This is just a starting point for you to gather some basic information on avalanche safety. This is one of the worst snow packs for avalanches in 30 years. Colorado is the deadliest state for avalanche fatalities. 25 people have died this year so far in avalanches, and there are two to three more months of skiing. There are deep instabilities in the snow that will probably last well, well into the spring. Human error is a HUGE contributing factor to avalanches. 1) Take an AIARE-certified Avalanche 1 class. Boulder-based Alpine World Ascents offers great Avy 1 classes and there are several courses coming up in March. 2) Read the Colorado Avalanche Information Center (CAIC) website everyday to monitor backcountry conditions all season long, not just the day you plan to ski. 3) The best way to survive an avalanche is to not get in one. So, again, take an Avy 1 class. If you are new to the backcountry, stay out of it. This is not the season to learn on your own. If you have some experience, give yourself a wider margin for error. It’s an outlier year, and outlier avalanche incidents are happening. 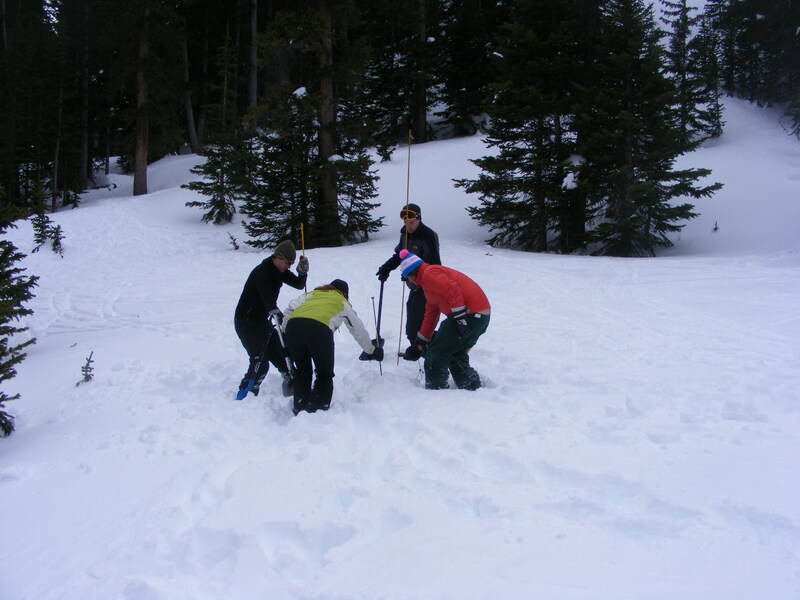 4) Always travel with a beacon, shovel and probe, and know how to use them. Make sure your beacon is on before going into the backcountry and make sure you trust your partners’ abilities to rescue you. Invest in an airbag system backpack like Mammut’s RAS pack. These are life savers and game changers. The woman who survived the Stevens Pass avalanche last week (in which 3 people next to her died) credits her ABS bag with saving her life. The concept is this: when you get caught in an avy, you deploy your ABS bag. A huge, balloon fills up around your head and neck. This increases your volume. Physics says that bigger objects rise to the top in moving fluid–inverse segregation. So the airbag system helps you to stay at the top of the avalanche bed and not get buried. It also offers a bit of protection for your head and neck. Many people who die in avalanches, die from head trauma. 5) Before you commit to skiing an avy prone line, scope out an escape route, an exit strategy. Should something go wrong, have a plan for how you are going to get out of harm’s way. But this is easier said than done. An avalanche happens so quickly, you barely have time to realize what’s happening, before you are being swept away. 6) If you start skiing something and an avy rips, try to ski out of it by skiing down a bit to get momentum, then cutting perpendicularly to the side of the path. 7) Once you realize you can’t get out, deploy your airbag. 8) Fight like all get out to stay at the top of the avalanche. Some people say to use a swimming motion to stay on top. Grab a tree, a rock, do anything you can to not get buried. 9) Once the avalanche stops, if you are able to move your arms, create an air pocket around your face. Punch one arm up through the snow (assuming that you know which way is up and which is down) so that your partners can find you. Then try to relax and trust that your partners will find you. You need to conserve that air–so don’t start hyperventilating. Again, the best chance for surviving an avalanche is not to get into one. So, take an Avy 1 class, be smart when heading out into the backcountry, or maybe just call this year a scratch. For technical questions about snow pack and avalanches, contact Markus Beck at Alpine World Ascents or the Colorado Avalanche Information Center.